IFFCO-Tokio General Insurance is a joint enterprise between the Tokio Marine and Nichido Fire Group, Indian Farmers Fertilizer Cooperative (IFFCO) and its associates. It commenced its operations in December 2000. Inform the insurer as soon as the mishap takes place and register your claim. To register your claim call IFFCO-Tokio’s customer car on their toll-free number 1800-103-5499. If the damage is a major one, report the accident to the insurer before moving the vehicle form the spot of the accident so that IFFCO-Tokio can arrange for an authorised surveyor to come and conduct a spot inspection. After the spot inspection is done, drive or get your vehicle towed to the nearest garage and get a repair estimate. Submit a duly filled and signed claim form and repair estimate to the insurer. On receiving the documents, the insurer will arrange for a detailed survey to assess the damages and determine the repair estimate. You will also have to submit the originals and copies of the vehicle Registration Certificate and valid Driving license of the person who was driving the car at the time of the accident. Get the copies verified against the originals. After the documents verification, the insurer will give approval to the garage to repair your car. In case of a cashless claim, the insurer will settle the repair bills directly with the garage or in case of reimbursement claim, you will have to pay for the repairs yourself and the insurer will reimburse the amount you spent on the repairs. In case of injuries to a third party involved in the accident, arrange for medical attention. Note down vital details such as vehicle numbers, number of vehicles involved, people involved in the accident, etc. Submit the requested documents to the insurer to process your claim. File an FIR at the nearest police station in case your car has been stolen and obtain a copy of the same. Inform the insurer as soon as you file the FIR and register your claim. To register your claim call IFFCO-Tokio’s customer car on their toll-free number 1800-103-5499. Provide IFFCO-Tokio all the necessary details of your car and submit a copy of the FIR report. Inform your RTO about the theft via a letter. Inform your financier of the theft and request them to discuss the case with IFFCO-Tokio. In case the vehicle is recovered by the police or otherwise, intimate IFFCO-Tokio. In case the vehicle is recovered, the insurer will pay for the damages or losses if any. In case your vehicle is not recovered, you will have to collect a Non-Traceable Certificate (NTC) from the police. In case you have availed a car loan to purchase your car, the insurer will settle the loan amount to the financier directly based on your car’s Insured Declared Value (IDV). If the vehicle was being driven under the influence of intoxicants. If the vehicle was being driven under a valid license. Damage/loss due to wars or nuclear risks or mutiny. What document should I submit as a proof for No Claims Bonus? The document to be submitted as a proof for No Claims Bonus is an authorised renewal notice from your previous insurer or you could also submit your previous policy copy. What should be done in case the mishap takes place outside of India? Inform the insurer as soon as the mishap takes place and follow the steps of claims procedure as instructed by the insurer. 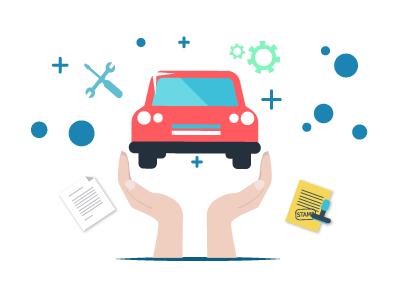 Will I still be eligible for No Claim Bonuses (NCBs) after my car insurance policy expires? Yes, you will be eligible for No Claim Bonuses (NCBs) provided you renew your policy within 90 days of the expiry of your previous policy. What Documents do I have to submit to renew my Policy? To renew your documents submit a copy of your previous insurance policy and your vehicle’s Registration Certificate. What is Insured's Declared Value (IDV)? Insured's Declared Value is the market value of your vehicle at any given point in time.